1. Versatile collapsible medium to large format folding cameras with three finders: optical viewfinder, rangefinder and sportsfinder. Image format is typically but not necessarily 4x5 inch. Rollfilm holders can be exchanged midroll to enable exposures on plates instead. 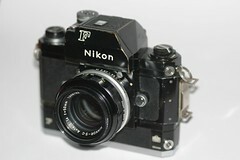 The cameras have view camera qualities, including front plate shifts and tilts. 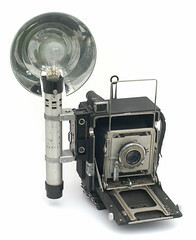 The cameras are combinable with professional flashes. Lenses are exchangeable. Some have a big grip. 2. 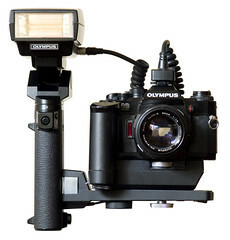 Sophisticated strut folding cameras which are due to their construction not as versatile. 3. Rigid body rangefinder cameras with superb exchangeable lenses and a big grip. 4. A SLR or a Digital SLR camera of a robust quality together with fast good lenses, electrical film winder, camera grip with additional batteries inside and professional flash. 5. 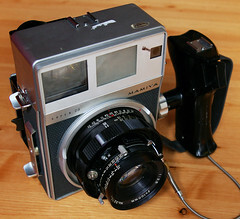 Any camera except low quality toy cameras can be used by pressmen to document situations. Of course most smaller or simpler cameras will have limitations that would reduce the quality or even the usability of the imaging results. Of course this article is mainly about type 1, 2, 3 and 4.